So take a good look at Pa Ingalls. Dreamy, ain't he? 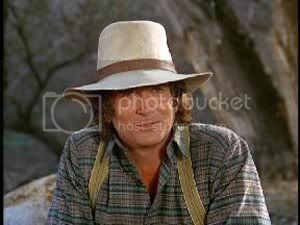 Good ol' Michael Landon. He's got those long flowing locks, a twinkle in his eye, and boy can he saw large planks of wood into smaller ones at the mill (ever notice that's all he did there?) like nobody's business. We weren't really allowed to watch much TV growing up, but nary a day passed that we all didn't sit down and catch the loving family antics of Laura, Ma, Pa, and the whole Ingalls gang. Where we truly believed that Ms. Beadle was the nicest teacher around, that Nellie and Willie were pure evil, and that Mrs. Olsen sure was a major bitty. We just couldn't seem to get enough of that quality family programming with the feel good thought provoking endings. I don't think a single episode of LHOTP went by without Pa shedding a tear or playing his fiddle, or Laura wearing that red gingham dress. This of course led to my current uncanny ability to actually know which exact episode is airing at any moment, based on watching only the first 15 seconds of the show. I'll be like, "Oh this is the one where Nellie pretends to be crippled", or "Oh this is the one where the wild dogs attack the kids while Ma and Pa are away". My sister and I use to pass the time on long car trips trying to quiz each other on random LHOTP trivia. Like how did Ma show she was irritated in bed? (Eat popcorn angrily), or why did the girls have such nice blue dresses for church (Ma was suppose to make a dress for herself but selflessly ended up making the dresses for the girls instead), or why did Laura sell her horse Bunny? (To buy a new stove for Ma for Christmas). So go ahead, throw your hardest LHOTP trivia at me, just see if you can stump me. If you too are a Little House fanatic, trying stumping your friends, it's FUN. Oh, and a few holidays back, my football playing, stud of younger brother who would probably never admit to watching LHOTP as a kid shocked us all when we gathered around to play one of the quizzes on the newly released DVD's (yes of course I own them). To our amazement he got every single answer right. He sheepishly shrugged but we all knew that he too had grown up on the prairie, even if it was involuntary. I'm not trying to "stump" you or anything. I was watching an episode where Ms. Olsen (Nelly's mom) adopts a wannabe Nelly and this new girl has a crush on some other boy in school who has no interest in her. Did she stay on the program? ok-was I vague enough with the "description"? I think that episode has to do with an overweight kid named Elmer. The other kids pick on him and Nancy pretends to like him so that he will bully the other school kids for her. Nancy stays with the show for the last season, until the series finally ends... as the new and "improved" Nellie (she's even more evil that Nellie) she came on way late right as the series was coming to a close. Thanks! Maybe you can be my "Dear Abby of Little House" as every time I try to watch the show at home, my husband finds things to do in the yard. Can't watch that OR Everybody Loves Raymond. Now, what could he possibly have against fun shows like that?! Party pooper! Michael Landon Jr. - He ain't no Pa.